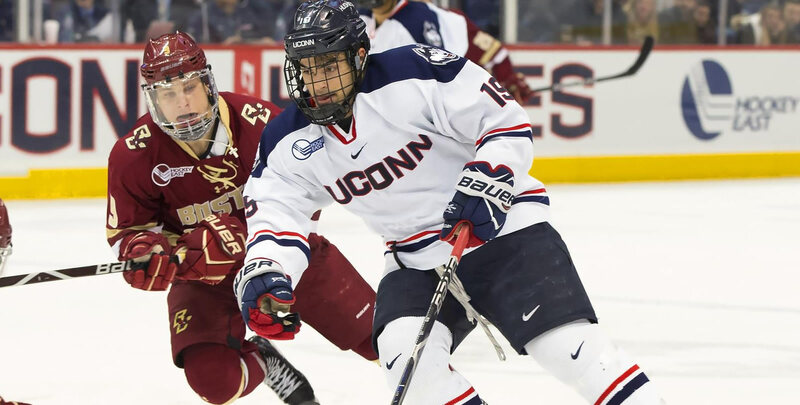 HARTFORD, Conn. - The Rensselaer Engineers finished two-for three on the power play and got a two goal night from Avon, Connecticut native Chase Zieky to deal the UConn Huskies a 5-2 loss in a non-conference match-up Wednesday night at the XL Center. The Huskies fall to 7-14-1 with the loss while RPI moves to 7-15-0. The Huskies got goals from sophomore Brian Rigali (Libertyville, Ill.) and senior Miles Gendron (Shrewsbury, Mass.) in the loss. RPI won the battle on special teams, going 2-of-3 on the power play while killing off all three UConn power play chances. The Engineers never trailed on Wednesday night with Zieky scoring the game's first two goals. The Huskies cut the RPI lead to 2-1 in the second period on Rigali's third on the year but a Todd Burgess power play goal at 19:16 gave the Engineers a 3-1 lead in to the final period. Gendron cut it to 3-2 in the early minutes of third period but Will Reilly pushed the lead back to two-goals at the midpoint and Brady Wiffen added the empty netter to seal away the win. RPI freshman goaltender Owen Savory stopped 31 shots to earn his second victory on the season. UConn's Tomas Vomacka (Trutnov, Czech Republic) made 23 saves. The Engineers held a 13-10 edge on the shot chart in the first and had the only goal of the period. Zieky gave his team a 1-0 lead just 5:40 in, his second on the season. Freshman Jake Johnson threw the puck on goal from the high point and Zieky banged in the rebound on his second try at the right post for a 1-0 lead. The Huskies outshot RPI in the second 12-11 but the Engineers scored twice on the power play in the second to build a 3-1 lead. RPI's Zieky notched his second of the night at 12:11, burying a one-timer right in front of Vomack off a feed by Ottoville Leppanen from behind the net, a power play goal, to put the Engineers up 2-0. The Huskies answered at 13:48 to cut the lead in half. Sophomore Evan Wisocky (Hoboken, N.J.) carried the puck into the zone and chipped it up to senior Max Kalter (Highland Park, Ill.) on the right half boards. Kalter fed Rigali into the slot and the sophomore fired on Savory then buried the ensuing rebound for his third on the season. A late power play chance resulted in the Engineers' third goal of the night. Jacob Hayhurst cycled the puck behind the net to Patrick Polino who fed Burgess sitting in the left circle, who buried on in the top right corner for his fifth on the year and a 3-1 lead at 19:16. The Huskies came out firing offensively to start the third and the Huskies captain pulled them within 3-2 at 2:15. Gendron came out of the right corner with a feed from senior Karl El-Mir (Montreal, Quebec) and rifled a shot past Savory, short side, his third on the season. El-Mir's assist extended the senior's point streak to six-straight games. RPI once again had an answer, pushing their lead back to two goals at 10:44. Burgess broke the puck out of their zone and Zieky sent a feed from the left wing to Reilly cross ice who buried the one-timer for his 10th on the year and 4-2 lead. The Huskies pulled Vomacka with just under five minutes left looking for a spark but the RPI defense and Savory held and Wiffen broke out of the zone with the puck to chip in an empty netter from the neutral zone to for the game-icing goal at 17:44. The Huskies will be off until next weekend when they take on the New Hampshire Wildcats in a home-and-home Hockey East series. The Huskies will open the series at home against UNH in the XL Center on Friday night, January 25.